YOUR VISION. FROM START TO FINISH. We source from quarries around the world. From India, China, South Africa, Canada, and Norway, you'll find over 42 distinct colors right at your fingertips. material. 24/7, our saws cut blocks, polishers finish slabs, while blowing rooms cut lettering and carve patterns. Non-stop production translates into better products at a better price. 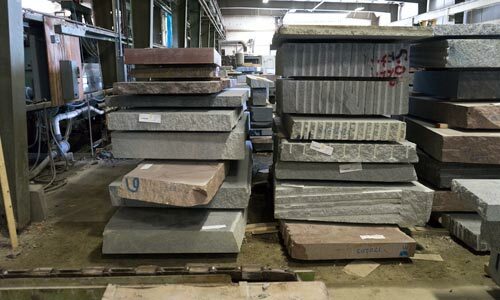 Our granite comes straight from the quarry. On average, these blocks weigh 20 tons, with the largest weighing up to 50 tons. 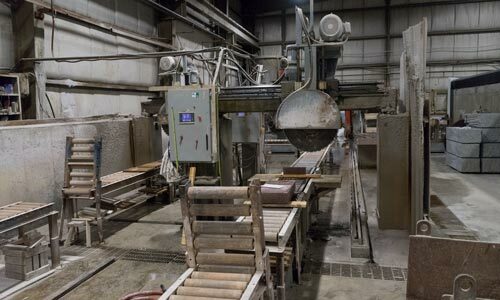 Our granite comes straight from the quarry. On average, these blocks weigh 20 tons, with the largest weighing up to 50 tons. When a block arrives from the quarry, it goes to the saw plant. 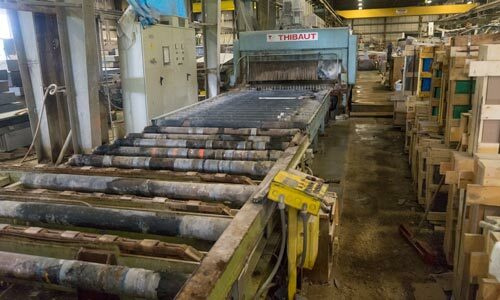 The cutting process is entirely automated; using two gantry diamond saws, each with a diameter of 11.5'. These saws run around the clock, suplemented by a diamond wire saw which allows for cutting taller blocks. On average, it takes 8 - 10 hours to saw through a single block. Cut slabs are then brought to the main facility thanks to "Aunt Bea" our 40 ton forklift. 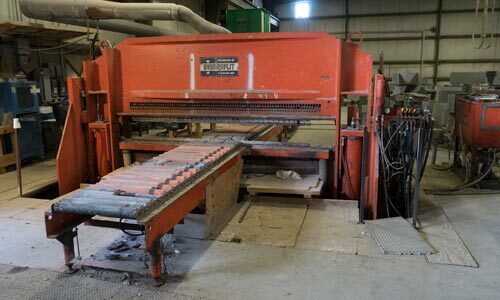 Our 12 head Slab Polishing line uses progressively finer grit bricks to transform a sawed slab to a polished one. This mirror-like shine is achieved without stains, varnishes or artificial substances of any kind. It's all-natural and permanent. The polished slabs move on to the 10' hydraulic splitter. 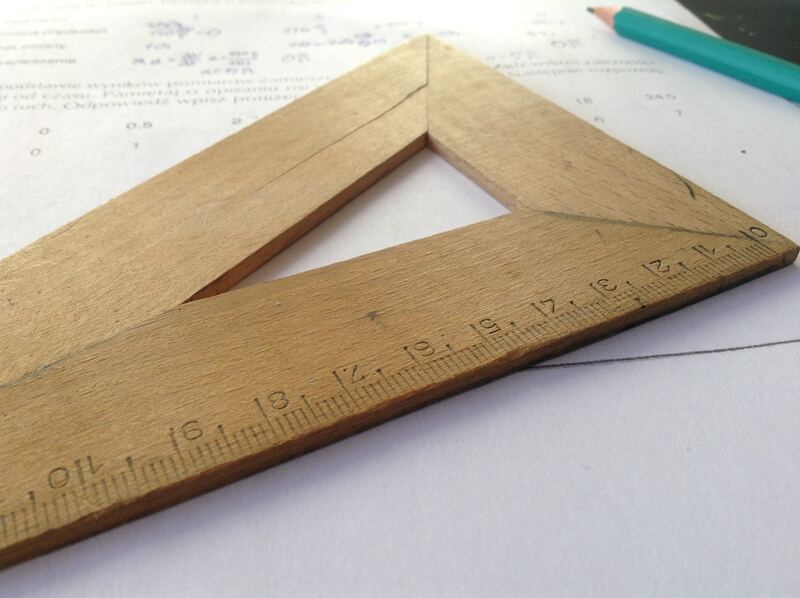 After determining the most efficient use of material, each unit is laid out and split to size. Moving on to the diamond joint saws, the base of each unit is cut flush for setting. We have 4 of these saws for various sizes and specifications. At this point polished 2 units will be rock-pitched. Polished 3 and Polished 5 units move on to have their tops and/or ends sawed and polished. 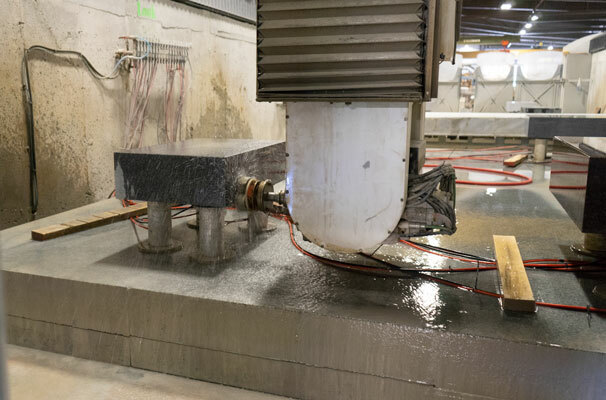 Around the clock, our CNC 3 axis router (seen here) will automatically locate each unit, polishing the tops and ends along with any precision tooling required. 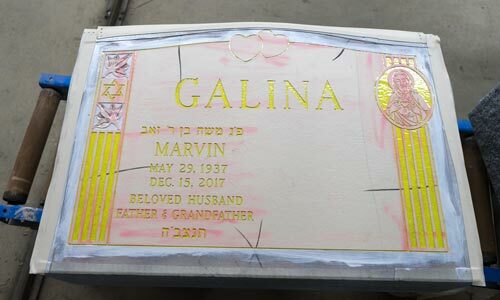 After a customer order is entered, any units needing sandblast lettering and/or carving go to the drafting department for a production drawing or "proof". The drawing is sent to our customer for approval. When the drawing comes back approved the CAD file is sent to the stencil cutter which prepares a high-strength rubber mat. 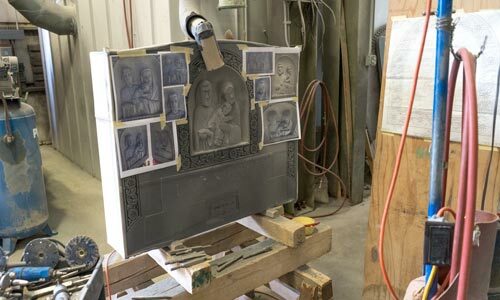 Our skilled sandblast craftsmen then adhere this mat to the face of the stone and carefully remove cut areas and touch up any details prepping it for the sandblast process. Stenciled units move on to the blowing rooms. Here the units are blasted with aluminum oxide at high velocity until all the un-stenciled area is sunk to a constant depth. 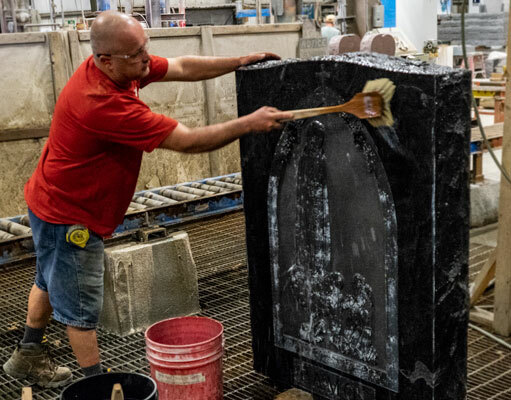 Units that require shape carving or hand-cut lettering are assigned to skilled stone carvers. They continue to sculpt the stone, giving the s/b depth and contrast. Recently shaped stone passes through the blowing rooms once more. This second step allows us to achieve sharper lines and even tones throughout the carving. Projects which require more complex sculpture go to a highly-skilled artist to be carved using a variety of diamond carbide pneumatic drills. 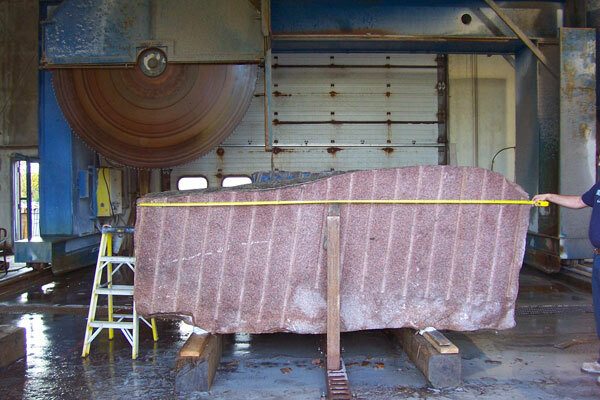 Granite sculpture can take days, weeks, or even months to complete. Highly-detailed full-size figures may take a year or longer to successfully execute. 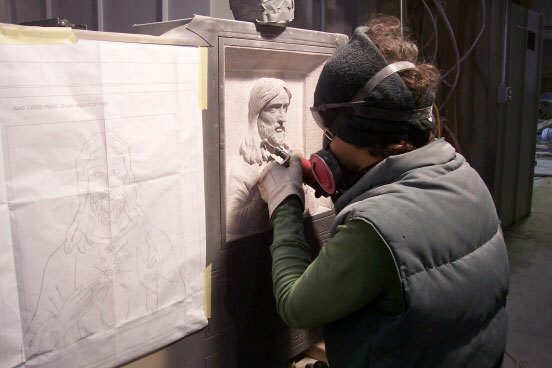 Many years of training and apprenticeship are required to become a proficient granite sculptor. Finished units move to the wash stand to be thoroughly cleaned. They are checked over carefully to ensure every detail is top-notch! The finished unit can weigh anywhere from 75lbs to 2 tons. This weight combined with unique shapes and sizes requires that each unit be individually packed. 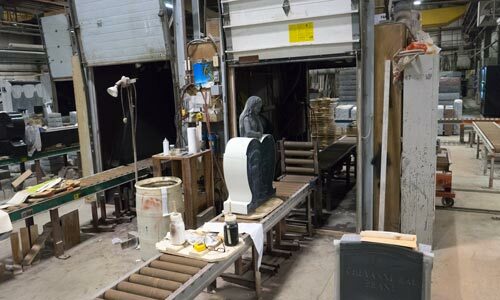 The stone is covered with plastic before a custom wooden crate is built around the unit. The polished slabs move on to the 10' hydraulic splitter. After determining the most efficent use of material, each unit is laid out and split to size. 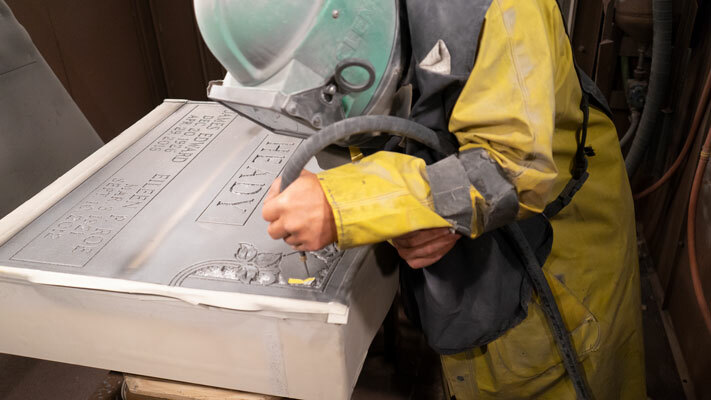 Projects which require more complex sculpture go to a highly-skilled artist to be hand carved using a variety of diamond carbide pneumatic drills. 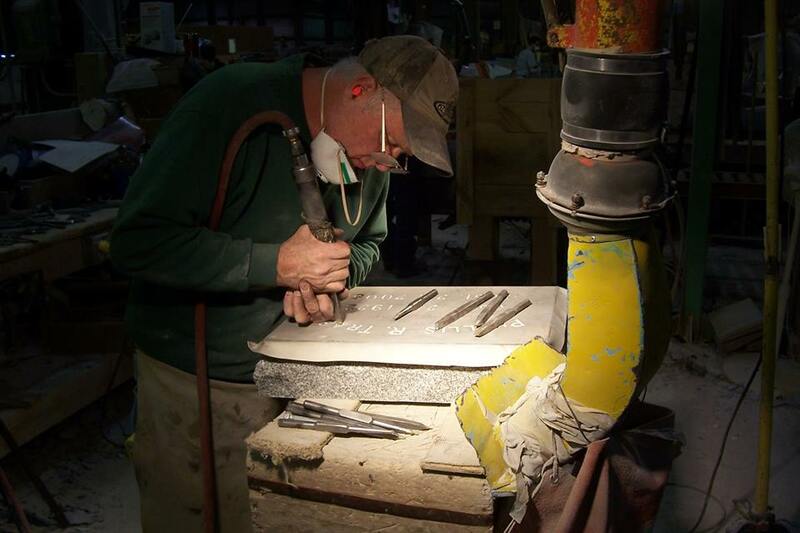 Granite sculpture can take days, weeks, or even months to complete. The finished unit can weight anywhere from 75lbs to 2 tons. This weight combined with unique shapes and sizes requires that each unit be individually packed. 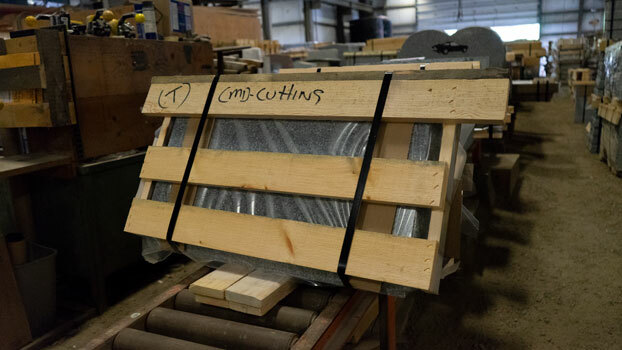 The stone is covered with plastic before a custom wooden crate is built around the unit.